The actor's ex-wife Norma Gibson alleged that he had 'viciously beat' their 10-year-old daughter Shayla so hard that she 'couldn't sit down'. 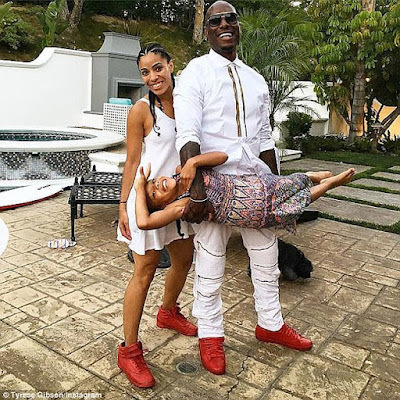 Tyrese Gibson being investigated by child services for alleged abuse of his 10-year-old daughterShayla was staying with Tyrese at the time and Norma claims the fight started when he accused the girl of stealing money she got for her birthday from her own piggy bank. On Tuesday in court, Norma's attorney confirmed that the LA County Department of Children and Family Services (DCFS) is now investigating Tyrese. The pair who are currently in a court battle as Norma is trying to get a permanent restraining order prohibiting him from physically disciplining their kid. She also wants full physical and legal custody because she's worried Tyrese will take their daughter to Dubai, where he has business ties, and not come back. In addition, the mother of one who also claimed that Tyrese "beat" the girl between 12 and 16 times wants him to take domestic violence courses. However, the actor says he only struck his daughter once on her bottom and that Norma is bitter that he married someone else that's why she's coming up with false allegations out of revenge. Also reacting to the claims, Tyrese's lawyer, Terry Levich Ross, told TMZ: "She's a lying piece of s***. Tyrese is devastated. He's a good guy and I will prove that." Tyrese Gibson who is now married to Samantha Lee was married to Norma from 2007 to 2009.